It seemed rather unfair to do a full response to the Damsel in Distress video in Anita Sarkeesian's Tropes vs Women series when only 1 part of 2 has been released so far. Considering it's been nearly 3 months and she just recently started talking about part 2, it's pretty understandable people are getting itchy (I sure am). In the meantime I decided to do a little test of character on her Facebook page. 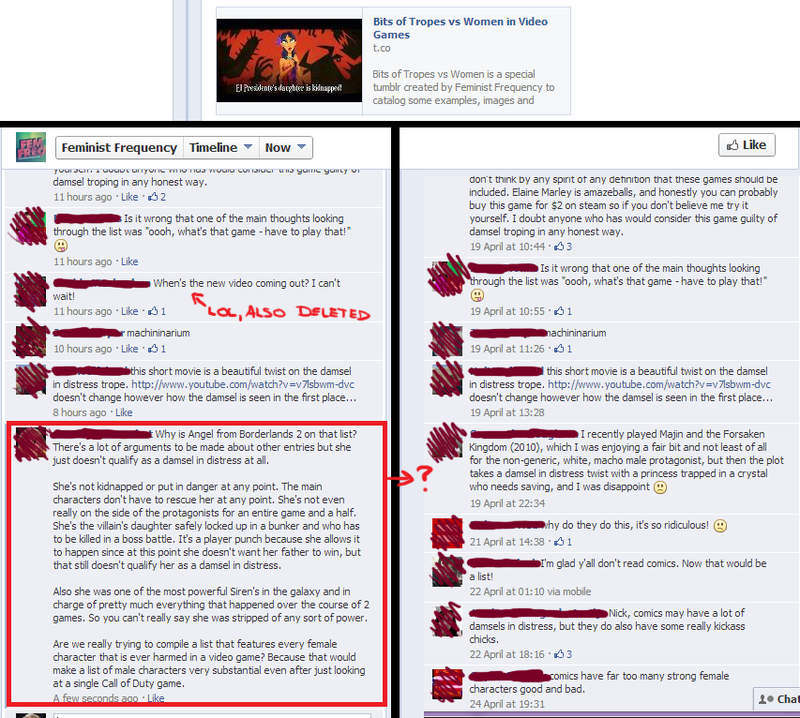 I had seen people posting about how even their mildest comments were removed and they were blocked from Feminist Frequency's Facebook page. Giving Anita the benefit of the doubt (these people could have been lying and you can delete your own comments after all) I decided to ask the question why Angel from Borderlands 2 qualifies as a Damsel in Distress. Which I'm actually genuinely wondering. Asking updates on the next video is also not allowed apparently. Yeah, I got snarky at the end of it but I wasn't attacking her personally. I wasn't part of some organized mob trying to defame her work. I was merely wondering how Angel qualifies as a Damsel in Distress. This got my comment removed and yes, I was blocked from her page. 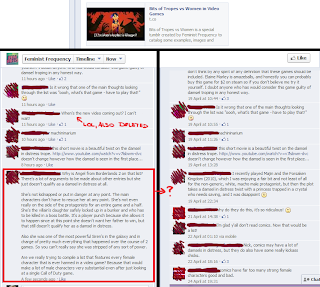 This is one thing that bothers me so much about Anita Sarkeesian. You don't want to engage the trolls? Fine, nobody expects you to. However not everyone who disagrees, has criticisms or just asks questions is a troll. If you can't even handle someone asking a question, perhaps you shouldn't position yourself in the middle of the conversation.